Question: When I sit out on my back porch, I’m looking directly into the neighbor’s backyard. I want to build a trellis and then plant something attractive which will give me some privacy. Do you have any suggestions? Answer: Creating privacy or blocking an unattractive view is easily accomplished by building a trellis. 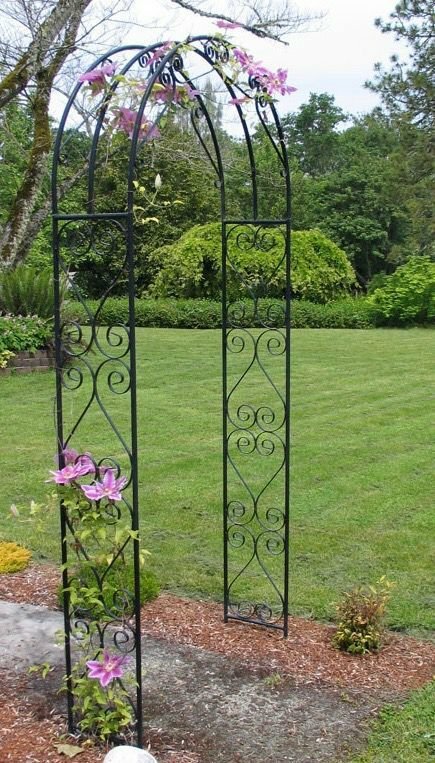 A trellis is a flat, freestanding structure used as a decorative fence, a wall or a privacy screen. A trellis is generally constructed by making a tight weave of open framework or by using intersecting pieces of lattice. In most cases, the trellis is covered with vines. The trellis helps support the vines and allows the plants to grow longer, higher and fuller than they would without the trellis. A trellis should be open enough to allow sunlight to peek through. When building your own trellis, opt for strength and size because vines can live for decades and grow heavy with age. If you are planting on a pre-existing trellis, carefully consider what to plant. Select a vine that won’t overwhelm the structure of the trellis when the plant reaches maturity. Once your trellis is built, you are ready to plant. One excellent choice for trellises is Etoile Violette Clematis (Clematis viticella). This variety is especially well-suited for the Pacific Northwest. This deciduous vine produces a profusion of small, dark violet-purple flowers up to 4 inches wide. The blooms are plentiful from mid- to late-summer. The vines are strong, easy to grow and grow quickly up to 10-15 feet. They thrive in moist, well-drained soils, amended with peat moss or ground bark. They grow well in sun or partial shade; however, the root area needs to be in the cool shade. You can achieve a cool root area by adding mulch, placing a large flat rock on top of the root area or by planting in the shade of a small shrub. Clematis plants prefer to have “their heads in the sun and their feet in the shade.” Fertilize every month during the growing season. Once the vines start to grow, tie the stems up immediately. Another great choice for trellises is the Trumpet Honeysuckle (Lonicera sempervirens). Showy, unscented orange-yellow to scarlet trumpet flowers will bloom during the summer. This vine produces scarlet fruit and has oval leaves with bluish-green beneath. Hummingbirds and butterflies are attracted to the Trumpet Honeysuckle. This variety requires well-drained, compost-amended soil. Space plants 3-5 feet apart in order to allow space for the vines to breathe which helps prevent mold and decay. Keep well watered and mulched with bark mulch to keep the soil consistently moist and to keep weeds away. These vines will grow 10-20 feet tall. Trumpet Honeysuckle plants should be planted during the spring because their roots thrive when cool and shaded. Make sure to wait until the final frost before planting. Locate a spot for planting where they will get full or partial sun. Newly-planted honeysuckle requires consistent watering, keeping the soil evenly moist until the plant starts growing vigorously on its own. Once established, water only during summer droughts of two weeks or more, giving the plant at least 1 inch of water each week. These are just two varieties that grow well on a trellis. There are many more to choose from which will help you to create a beautiful privacy fence. Email, call or visit the Douglas County Master Gardener Plant Clinic at douglasmg@oregonstate.edu, 541-672-4461, or 1134 SE Douglas Ave., Roseburg.